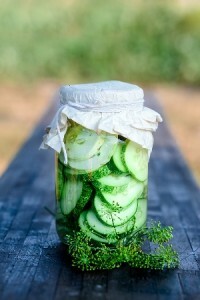 I love pickles, but when I tried this twist on the traditional “out of the jar” pickles I decided I wasn’t going back. They don’t take too long to make (outside of the parts where you’re waiting, but I’m sure you can find something productive to do during that time). They also end up with a really fresh taste. These pickles can also be stored in the fridge for up to two weeks so you can make them ahead of time and snack on them all week long! Put the sliced cucumbers in a colander in the sink. Sprinkle them with salt and let them sit in there for about 20 minutes. While those are sitting you can prepare the liquid. Add everything besides the cucumbers and salt to a medium saucepan. Bring to a boil and then reduce the heat and let it simmer for 10 minutes. Rinse and drain the cucumbers. Add them to a large heat resistant bowl. Pour the hot liquid over the cucumbers. Stir well. Refrigerate until at least room temperature (at least 10 minutes). Cover the extras with plastic wrap and they’ll last two weeks in the fridge.